The sizeable lead Barack Obama held over a generic Republican opponent in polls conducted earlier this year has vanished as his support among independent voters has fallen off.Currently, 41% of registered voters say they would like to see Barack Obama reelected, while 40% say they would prefer to see a Republican candidate win in 2012. In May, Obama held an 11-point lead. 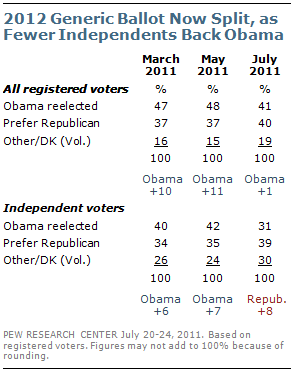 This shift is driven by a steep drop-off in support for Obama among independents. The latest national survey by the Pew Research Center for the People & the Press, conducted July 20-24 among 1,501 adults and 1,205 registered voters finds that just 31% of independent voters want to see Obama reelected, down from 42% in May and 40% in March. Where Obama held a slim 7-point edge among independent registered voters two months ago, a generic Republican holds an 8-point edge today. Meanwhile, there is no greater clarity to the GOP nomination race. Only about a quarter of voters (24%) have given a lot of thought to their 2012 options. That rises to just 30% among Republicans and Republican-leaning independents. Overall, Romney continues to hold a significant lead among Republican voters: 21% say they would like to see him win the nomination. 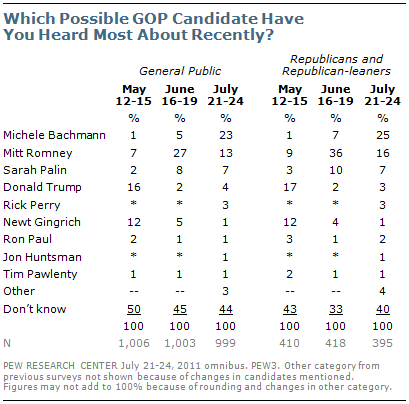 Rick Perry gets the support of 12%; 11% back Sarah Palin, 11% Michele Bachmann, 9% Ron Paul and 8% Herman Cain. No other candidate receives more than 3% of the support of Republican-oriented voters. Perry and Palin have not yet said whether they will run. The race for the support of Tea Party backers is even more up-for-grabs, with five candidates (Romney, Perry, Bachman, Palin and Cain) all garnering the support of between 12% and 16%. While Texas governor Rick Perry is a relatively new name in discussions of the GOP race, he is drawing strong interest from highly attentive Republicans. Among Republican and Republican-leaning registered voters who say they have given a lot of thought to the candidates, 22% support Perry, 15% Romney, 13% Bachmann and 12% Cain. And Perry’s lead is substantial among highly attentive Tea Party supporters. 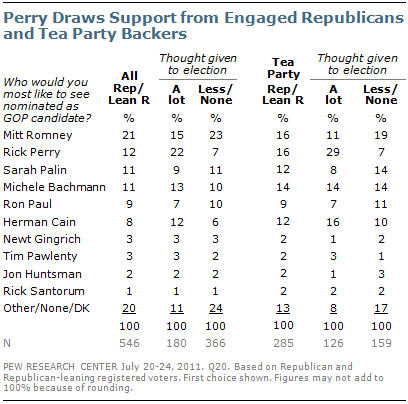 Perry has the backing of 29% of Republicans and Republican-leaners who agree with the Tea Party. That is nearly double the backing for the next closest candidate, Herman Cain (16%). 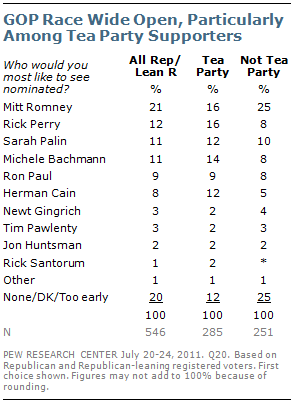 The overall frontrunner, Mitt Romney, receives the backing of 11% of highly engaged Tea Party voters. 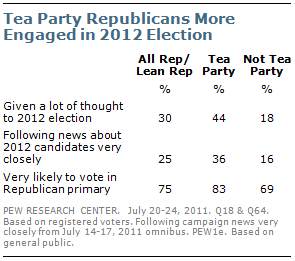 Early signs suggest that Tea Party supporters remain the most engaged and committed segment of the Republican base. Republicans and Republican-leaning independent voters who agree with the Tea Party are more than twice as likely as other Republicans to have given a lot of thought to the 2012 election (44% vs. 18%). They also are much more likely to say they are very closely following campaign news (36% vs. 16%), and significantly more committed to voting in their state’s Republican primary or caucus next year (83% vs. 69%). Some of these differences can be explained by the demographic profile of Tea Party Republicans. In particular, Republicans and Republican-leaning independents who agree with the Tea Party movement are significantly older and more highly educated than those who do not (See table). But even when these demographic characteristics are taken into account, agreement with the Tea Party is strongly linked with campaign interest and commitment to voting. Yet it is important to note that even among those who say they are very likely to vote in the 2012 primaries, only about half of Republican and Republican-leaning voters say they agree with the Tea Party movement. The other half either disagrees or has no opinion either way. While not a clear frontrunner, Minnesota Rep. Michele Bachmann is currently the most visible candidate in the GOP field. When asked what possible candidate they’ve heard the most about in the news recently, almost a quarter of Americans (23%) offer Bachmann’s name. But candidate visibility has fluctuated widely over the past few months. In mid-June, Americans said they were hearing the most about former Romney (27%). Now, Romney rates second, with 13% saying they have heard the most about him recently. Just two months ago, Donald Trump and Newt Gingrich were the most visible candidates in the field. Rick Perry has the support of many highly-engaged Republican voters, but his public visibility remains limited. Just 3% of Americans – and the same percentage of Republicans and Republican leaners – say he is the potential candidate they have been hearing the most about. Similarly, fewer than 1% cite Herman Cain as the candidate they have been hearing the most about recently. Has Press Coverage Been Fair? While Bachmann has been in the news a great deal recently, there is no impression that news coverage of the Minnesota representative has been too tough. 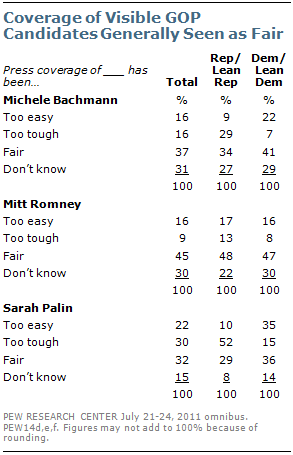 Nearly four-in-ten (37%) say recent press coverage of Bachmann has been fair, 16% say it has been too tough and 16% say it has been too easy. Roughly three-in-ten Republicans and Republican leaners (29%) say the press has been too tough on Bachmann, but about as many (34%) say it has been fair. A larger plurality sees coverage of Mitt Romney as fair (45%). Just 9% say recent coverage has been too tough, while 16% say it has been too easy. Republicans express similar views: 48% of Republicans and Republican leaners say coverage of Romney has been fair, with about as many saying the press has been too easy on him (17%) as too tough (13%). The public is more deeply divided in views of how the press covers Sarah Palin. Currently, only 32% say press coverage has been fair, but there is no consensus on what the bias is: 30% say it has been too tough and 22% say it has been too easy. As has been the case all the way back to the 2008 election, perceptions of how the press treats Palin are deeply polarized along partisan lines. Roughly half (52%) of Republicans and Republican leaners say news organizations are too tough on Palin, compared with just 15% of Democrats and Democratic leaners. Democrats are about three times as likely as Republicans (35% vs. 10%) to say the press is too easy on her. Obama’s reelection support is well behind the 10-point lead George W. Bush held over a generic Democratic candidate at a comparable point in 2003. Bush enjoyed a substantially stronger approval rating in July 2003 (58% vs. 44% currently for Obama), yet his support was also slipping. By October of that year, a Pew Research Center survey found him running even against a generic Democratic candidate (42% to 42%), as Obama is today. Bill Clinton was also running about even against a generic Republican candidate in the summer of 1995, though Pew Research Center polling in that year included the option of preferring an independent candidate. That was the choice of 23% of voters at that time. Obama’s overall approval rating, at 44%, is comparable to Clinton’s in the summer of 1995. In late 1991 George H. W. Bush also ran even against a generic Democratic candidate, despite a fairly solid 55% approval rating at the time. With economic conditions in the nation quickly souring, his standing quickly fell. By February of 1992, as the Democratic primaries that would ultimately select Bill Clinton were underway, Bush trailed a generic Democratic candidate by 10 points. But by most measures Barack Obama faces a more somber public mood and a more troubled economy than did any of these previous presidents. With just 8% saying the national economy is in excellent or good shape and only 38% rating their personal finances positively, economic assessments are as negative as they were for George H. W. Bush as he entered his reelection campaign. However, the current unemployment rate is much higher, and overall satisfaction with the state of the nation much lower, than was the case in late 1991.